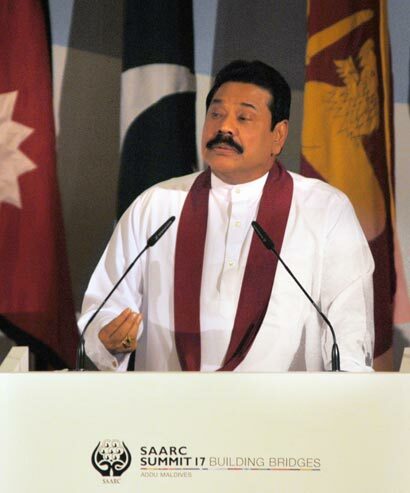 President Mahinda Rajapaksa says the issues which call for attention of the SAARC region, particularly in the areas of social justice and climate change require not further discussion but immediate action. The President of Sri Lanka made these remarks in his address on the inauguration day of the 17th South Asian Association for Regional Cooperation (SAARC) Summit, held in Addu City of the Maldives Islands today on 10 November. Addressing the summit the President further said the SAARC region has unique potential of our human resources and the talent and creativity of our people is the greatest strength of the SAARC nations. “What is evident around us is a mood of urgency and even impatience. This is especially so, because a large and influential part of our societies consists of young people, inspired by new ideas and looking forward with enthusiasm to a promising future for themselves. They cannot be kept waiting for long. Patience is not infinite”, he added. President Rajapaksa further stated that it is necessary to enable school children to live a full life and take their place with their heads held high as worthy citizens of the future. Education, health facilities and modern communication, must be made available to all. President noted that ignorance, disease and poverty are the common enemies of all our nations. Common approaches to combating these evils must go to the root of initiatives by the governments at this time. Social equity must go hand in hand with economic progress. Whether in regard to food and energy security, the preservation of the environment or protection of SAARC societies against the consequences of terrorism, the challenges the nations face are certainly formidable. The President said, however, we are sustained by a reservoir of insights and experience that equip us for this task. The theme of our deliberations here in Addu City, ‘Bridge Building’, highlights the reality that rapidly improving connectivity in our region makes it possible for us to reach out to higher levels of achievement for the benefit of our nations,” the President added. It is my great pleasure to be present in this beautiful and scenic Addu City of the Maldives for the 17th SAARC Summit. I wish to thank President Nasheed and the people of Maldives for the excellent hospitality. President Nasheed, today is a most memorable day for your country as you assume the Chairmanship of SAARC. I wish to extend to you and to the people of the Maldives, the unwavering support and best wishes of the Government and the people of Sri Lanka as you seek to steer our organization to greater achievement. Excellencies, before I proceed further, may I take this opportunity to pay my tribute to the outgoing Chair, Prime Minister Thinley who has provided an outstanding leadership to SAARC during Bhutan’s Chairmanship. It may not be out of place, if I avail of this Forum to convey our warmest greetings to His Majesty the King of Bhutan on his tying the nuptials. I also wish to compliment Ms. Fathimath Dhiyana Saeed, the first ever female Secretary General of SAARC and her team for their devotion and efficient work. During this Summit in the Maldives, the signing of a number of SAARC Agreements will upon implementation, further strengthen the framework for regional cooperation especially in the fields of trade and investment. We have always believed in the unique potential of our human resources in the SAARC region. The talent and creativity of our people is the greatest strength of our nations. We, the leaders of SAARC countries have, therefore, a sacred duty to nurture and develop the skills of our people and enable the full flowering of their personality. This is why we have been strongly committed to programmes of social action which ensure that access to opportunity is not denied to any segment of society. Schools in the rural hinterland, which have been deprived of essential facilities for so long, must be upgraded as a matter of priority in all our countries to provide total education. This is necessary to enable our school children to live a full life and take their place with their heads held high as worthy citizens of the future. We in Sri Lanka are passionate believers in social mobility. Education, health facilities and modern communication, must be made available to all. Governments owe no less to our people, as it is only in this way that the advantage of political empowerment can be enjoyed in full measure by our people. Ignorance, disease and poverty are the common enemies of all our nations. Common approaches to combating these evils must go to the root of initiatives by our governments at this time. Social equity must go hand in hand with economic progress. One of our deepest convictions is that economic progress comes alive in the everyday experience of our people only if it is manifested in better infrastructure. Benefits arising from economic development do not automatically percolate down to the grassroots level. Proper intervention by governments is necessary in our region to achieve this objective. A necessary condition for achieving all these is peace and security throughout our region. Another of our convictions is that, in formulating policies for the well-being of the peoples of SAARC, we need to recognize that there is no size that fits everyone. The values nurtured by our civilizations represent an essential part of the legacy we inherit and cherish. We yield to no one in the pride we legitimately feel in the achievements of our ancestors, and what they believed in. Whether in regard to food and energy security, the preservation of the environment or protection of our societies against the consequences of terrorism, the challenges we face within SAARC are certainly formidable. However, we are sustained by a reservoir of insights and experience that equip us for this task. Our own cultural traditions and the aspirations and beliefs which have been handed down from generation to generation must be the basis of the solutions we evolve to the issues confronting our nations and not solutions imported into our societies. Sustainability is a hallmark of home-grown solutions. Approaches to development which SAARC nations follow have another feature in common. That is, we have consistently refused to measure development solely in terms of money, or money’s worth. The people we represent are worthy of a more wholesome yardstick of development. Deep-rooted spiritual convictions are an essential part of our lives. An inner peace of mind and a sense of contentment and satisfaction, instilled in us by the founders of our great religions, lie at the core of our philosophy of development. In the troubled world in which we live, we must surely reflect that there is no other age in which this philosophy was more relevant, or more desperately needed, than it is today. These are the well-springs of our motivation, as leaders of SAARC, to draw upon the collective strength of this Organization to serve our peoples with the commitment and dedication they deserve. What is evident around us is a mood of urgency and even impatience. This is especially so, because a large and influential part of our societies consists of young people, inspired by new ideas and looking forward with enthusiasm to a promising future for themselves. They cannot be kept waiting for long. Patience is not infinite. The issues which call for our attention, particularly in the areas of social justice and climate change, require not further discussion but immediate action. The theme of our deliberations here in Addu City, “Bridge Building”, highlights the reality that rapidly improving connectivity in our region makes it possible for us to reach out to higher levels of achievement for the benefit of our nations. I am certain that we have in this hall sufficient resolve and vision to deliver effectively, according to the expectations of our peoples. Let us, therefore, collectively strengthen our resolve and make SAARC a really potent instrument for the service of all our peoples. Let us remember the wise words of Lord Buddha who declared in the Dhammapada – Atta hi attano natho, kohi natho paro sia – One’s solace lies in oneself, what other master could there be?! Despite the leadership by Sri Lanka in many spheres, I am devestated to note the Commonwelath Games Committee nomination of Australia’s Gold Coast as the venue for the 2018 games. I am shocked beyond belief to learn the Committee has not considered the social impact of this decision. The World’s greates spin bowler, Muralitharan, the rehabilitated ex-LTT 2nd in Command, Minister Muralitharan, SL’s economics wiz, Mr Cabraal all joined in this pitch. The Sports Minister should promptly call for an international investigation into matters leading to this vote and seek assistance of UN Secretary General to solve this mystery. The Acting Representative to the UN, Brig Shavendra Silva should sidestep his war crime charge woes and come out blazing to correct this wrong to a nation that awaits a fair outcome. It is obvious rump LTT elements had a hand in this disaster. This decision could have significant impact on the ruling family in Sri Lanka and the majestic highway to the south which is to opened by the President could turn out to be grazing ground for stray cattle. I read your wise comments and wish to know the nation’s conscience Nicholas and Manjula’s opinion on this before I could concur! Please read my views under the heading, “Gold Coast picked for 18th Commonwealth Games venue” which appeared on 12/11/11.